When servicemen and women returned home following World War II, there was a rash of marriages, children born, and other major life changes that flooded the housing market and caused major ripples through the nation’s economy. The Department of Veterans Affairs pushed legislation that came to be known as the G.I. Bill as a way to provide for those who served their country. And, while there have been a few adjustments, the G.I. Bill provides benefits for those who serve in the US military today. There may not be as noticeable of a rush to get married, have children, and buy homes as there was immediately following World War II, but the benefits of the G.I. Bill are still there to provide assistance. If you’re in the market for a new home, let your veterans home loan benefit help you make it happen. That’s right, if you choose to use your VA loan, you won’t need to come up with a down payment in order to get approved. The Department of Veterans Affairs insures a portion of the loan, so lenders will provide you with a loan for 100 percent of the house’s cost, no down payment needed. This is a great option in particular for those who are buying their first and don’t want to completely empty their savings in order to make a down payment. Instead, save that money for repairs or other expenses that may crop up once the home is yours. Piggy-backing off the first reason is this: veterans home loans don’t need mortgage insurance no matter how much or little you have to put down. Generally, most loans require mortgage insurance if your down payment is below a certain threshold in comparison to the price of the home. However, because VA home loans are partially guaranteed by the Department of Veterans Affairs, lenders know they will be paid either way, negating the need for mortgage insurance. So, choosing veterans home loans can save yourself money on your monthly payments. Most mortgage lending terms are multiple decades, but life changes often mean selling that home and moving before the loan has been paid off. That’s not really a big deal since the sale of the house pays off the remainder of the loan, often with money left over. But veterans home loans offer a unique advantage: they can be assumed. When you go to sell your home, as long as the VA approves the transfer, the buyer can simply pay a transfer fee and take over the existing loan. That saves both of you fees, but it can be even more beneficial because the buyer takes over the loan terms as they are. If interest rates have gone up in the years since taking out that loan, that’s a pretty appealing benefit to buyers — which can often translate to better benefits for you as a seller, as well. VA home loans are not actually loans provided by the Department of Veterans Affairs; instead, the VA simply guarantees part of the loan. What this means in translation is that veterans home loans can be obtained through any VA-accepted lender — and there is a long list of companies permitted to offer them. 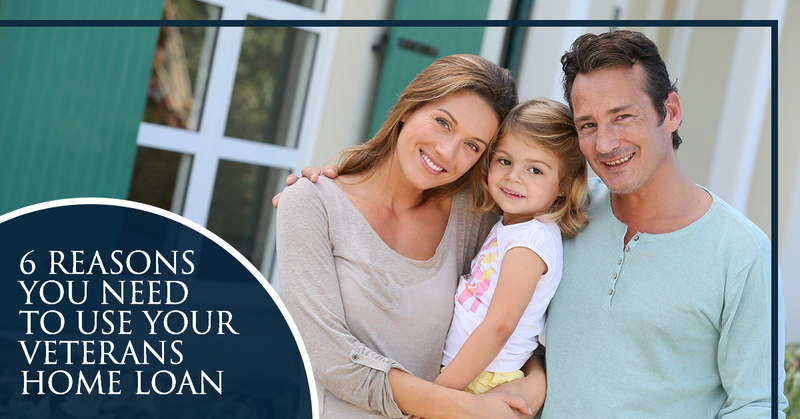 Choosing to use your VA home loan benefit means you still have different loan terms available to you through a range of different lenders, you just get the VA loan benefits in addition to whatever the loan’s terms are. One of the most common pieces of knowledge that first-time home buyers in particular aren’t prepared for are the various fees collectively referred to as closing costs. Well, when you use your VA loan benefits, you are actually limited in the closing costs you are allowed to pay. Lender-originated fees, such as underwriting and loan processing fees, aren’t allowed to be charged to the borrower of a VA home loan. They can be asked of the seller or charged to the lender, but not the borrower. Also, veterans home loans allow you to include closing costs in the amount of the loan (even including the VA funding fee). Using your veterans home loan benefit also helps relax credit score requirements. It’s similar to the reason that mortgage insurance isn’t required. Since the Department of Veterans Affairs guarantees a portion of the loan, lenders have a better assurance that they will get back the money lent. The VA’s goal is to help more veterans purchase homes, so they don’t require as high of a credit score as many other loans. In addition, they provide loan mediation services in the off-chance that a borrower can’t make their payments. Note: this doesn’t mean that there aren’t repercussions for a borrower who can’t pay, it just means that the VA will work with both borrower and lender to reach an agreement before bankruptcy and eviction come into question. Learn more about how veterans home loans can benefit you. Start by contacting the VA-approved team at Patriot Home Mortgage to see what we can do for you!